DFA Energy is pleased to announce a partnership with Jordan Energy to give you access to the expertise necessary to take on a solar energy project. Through DFA Energy's Preferred Vendor Network, Jordan Energy can assist with project planning, development and support, and provide discounted pricing on solar energy systems in the Northeast Area. Renewable energy systems can be a challenge without the right partner. That's why DFA Energy has teamed up with Jordan Energy, a company our members trust. Since its formation in 2007, Jordan Energy has developed 34 solar projects totaling 1,127 kilowatts of renewable energy production for dairy and farm producers in New York and New England. • Dairy Management Inc., Dairy Innovation Center, and Dairy Sustainability Council. 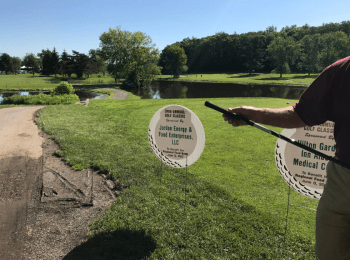 Jordan Energy & Food Enterprises , LLC was a sponsor for the Regional Food Bank of Northeastern New York's 34th Annual Golf Classic.